If you love raspberries too and find yourself picking them at Crowfoot Farm in the next few weeks, here’s some raspberry back story to occupy your mind as your fingers fill your berry bucket. The raspberries are Cascade Delight, a cultivar released in 2003. It was developed to withstand root rot, a condition that shows up in June as yellowed leaves and wilting plants but that actually begins in winter when roots that have reached down to moist clay subsoil in summer rot in winter when the clay fails to drain. 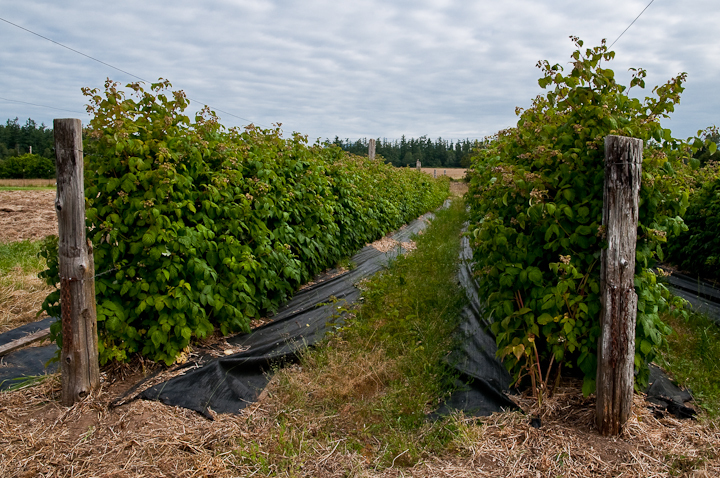 Eric described what he saw when he visited the agricultural experimental station that bred Cascade Delight: “It was just so awful looking, fifteen acres of the most sickly raspberries because they had purposely planted them in a root rot prone area. But then here and there was a raspberry that was doing beautifully. And that’s how they bred Cascade Delight.” Lucky for us that the cultivar emerged: most of our island topsoil rests on clay. And as for the raspberries themselves: how does a perfectly ripe raspberry get that way? “When berries themselves get sun, they have better flavor,” Eric said. Remember that thinning and pruning? But, “too much sun can cook raspberries. The kernels get white and opaque and the flavor is ruined.” Notice that Crowfoot Farm’s raspberries are in rows stretching north south, an orientation that distributes sunlight more evenly over the rows than an east west orientation. And notice the straw mulch and the irrigation lines. Raspberries need a lot of water along with the sun to develop flavor. Finally, how can you tell if a raspberry is ripe? If it comes off in your hand when you touch it it’s ripe. If you have to tug, it’s not. And now you have a bucket of raspberries. What’s next? “They are awfully good in all kinds of desserts, but we just mostly eat them,” Elf and Eric said. And they freeze the excess, putting half full picking buckets right into the freezer and then, the next day, knocking out the berries which separate neatly and putting them in freezer bags for winter treats. Whatever you do with your raspberries, now that you know more about them, maybe they’ll taste even better.